Discussion in 'Replica Props' started by dr_slurpee, Mar 30, 2006. Ok, last night I was looking through Ariel for a couple grabs of the badges (and other things) when I noticed something odd about them compared to the ones seen in the photos from the con in the UK...that being they aren't exactly the same. Now I know what some of you might be about to say, but the badges remain consistant from scene to scene throughout the show, and the only chance there could be different (hero) badges is when they use their badges to enter the supply room...more on that later. 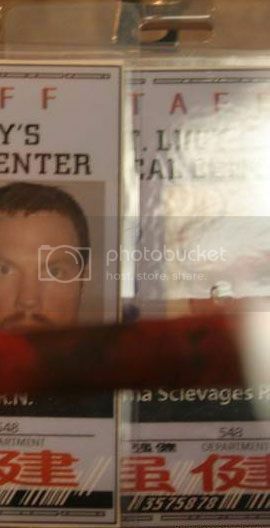 The first I noticed was Jayne's badge. The one he's wearing on the show does not say "KiKi Larue R.N." Here's a pic of the one that was on display. And here are a couple grabs that I adjusted the brightness and also blew up the name portion of. It's clear that it says "Dr. _______ ________" thought I can't tell what. The anomoly on the one from the screen grabs is that his name is much wider than the one on display. 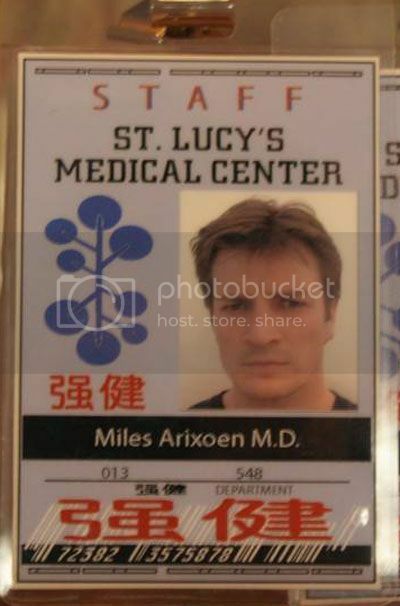 It still looks like it says "Miles Arixoen M.D." as you can see here. But when you look at the width you can see that they start and end in different positions on the screen grabs and the display one as indicated by the green lines. 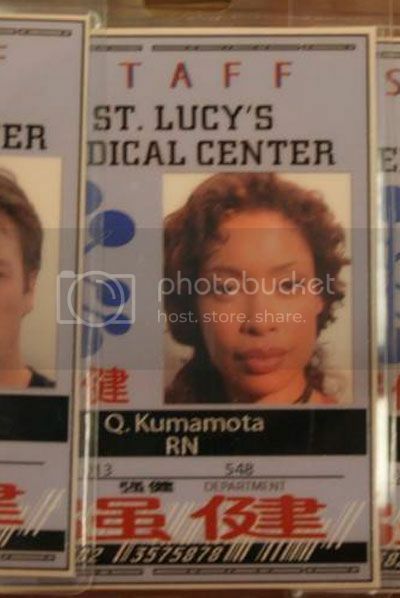 The problem with hers is that the display one has her name ("Q. Kumamota") on one line and "RN" on the other, but the screen grabs show something different. Too hard to make out what it says but it's something like "___ ___________ M.D." Finally Wash's ID. The display one has most of his name obscured, it's "______ma Scleavages RN" (anyone have any idea what his first name is?). 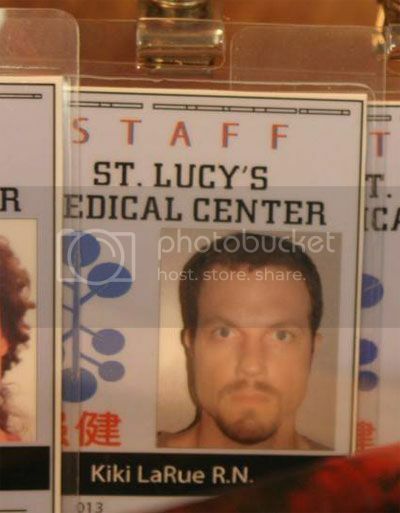 Wash's ID is the least visible on the show but you can clearly make out his name being on 2 lines (like Zoe's display ID, but not the same name). It could well be the same "______ma Scleavages" name and RN on the second line. So, with all the IDs having some inconsistancy with the ones that were on display I am left puzzling over where the display ones came from? The agrument for "hero" and stunt IDs wouldn't really fly because if they wanted to make duplicates they would simply print out the files again, why change them? I suppose one could go out on a limb and say perhaps they didn't keep all the files and when they re-created them (for whatever reason) they weren't consistant, but given that everywhere in the episode that you could see any bit of the names they were always the same it seems unlikely that they would have to create another set of them (acknowledging that they might have started with many sets of IDs in the first place). As to the "hero" IDs, there could have been IDs that were more elabourate but I could find no evidence to say that they weren't wearing the same ones all the time. The IDs do have a flip down security portion that they use in the scanner on the door of the supply room. 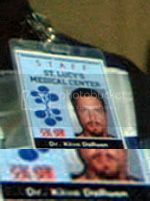 There were no really good grabs of Mal and Zoe's IDs having this so the best one I could get was of the doctor they knocked out (see below). 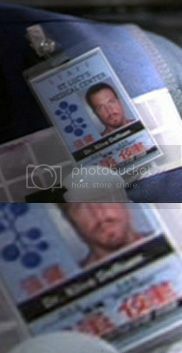 Jayne's ID either did not have that security flap or he didn't have a "hero" version because in one scene you can see the back of his ID and there is nothing there, no flap or anything. So, I know I might be over analyzing this and I am in no way saying that the ones on display were fake or anything, I am just trying to sort this out...anyone got any ideas? Perhaps the ones on display were production used prototypes. I think the name on Wash's badge says " E Norma Sclevages "
It could be that the names were digitally changed when released - due to legal reasons. They were really good at adding CG on the fly where needed. With scanners and all. Does anyone have any idea of what the Asian characters say? I love the use of Chinese in the show for swearing and on so many things on set.